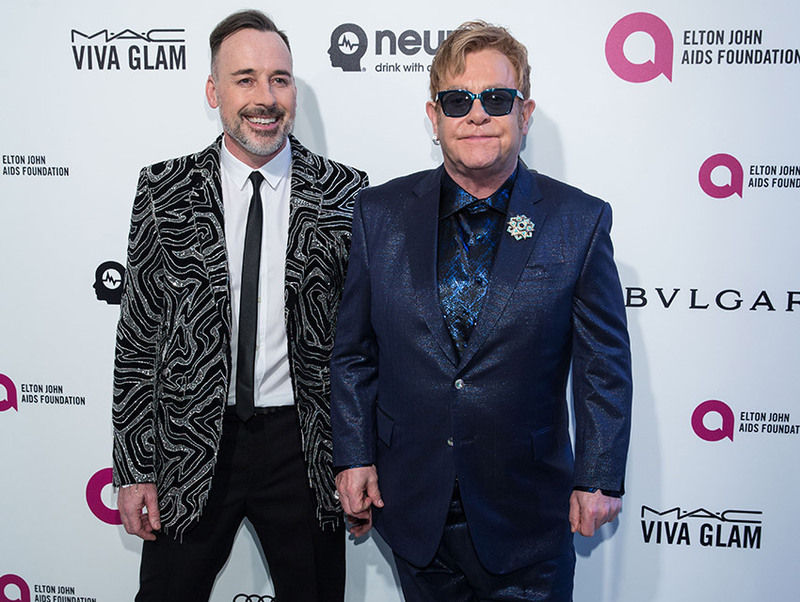 Sir Elton John and David Furnish raised $6.2 mil (a record) last night for the Elton John AIDS Foundation at their annual Academy Awards viewing party and dinner in West Hollywood. Getting into the spirit of the evening? Hilary Swank, who offered up her BVLGARI Serpenti ring (white gold and diamonds) on the spot during the live auction, fetching $40,000. Bulgari also announced a three-year partnership with EJAF. Elton John has held his Oscar viewing party for the last 23 years. I remember one year he threw in a surprise birthday party for Dame Elizabeth Taylor (who spent many years of her life devoted to raising awareness and finding a cure for HIV/AIDS) during the event. Some of Taylor’s BVLGARI sparklers were even on display at last night’s party. This year, the lavish affair (which included dinner prepared by chef Gordon Ramsay) in West Hollywood Park drew everyone from Swank to Caitlyn Jenner to Mariah Carey to Charlie Sheen. Sheen arrived wearing a t-shirt with his image on it that read “Stay Positively Negative.” This annual fundraiser has raised more than $50 million to date. Next articleThe Best Reaction GIFs to Come Out of the 2016 Oscars, and How to Use Them in L.A.